A thick, mild salsa every Star Wars fan is sure to love. 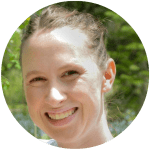 If you’re planning a party and want to serve chips and salsa, skip buying the salsa at the store. Homemade is better, and just as easy to make! I’ve made this salsa several times before but since I knew there were going to be a lot of little kids eating it I wanted to make a milder version. And everyone really liked it; even people that have had my spicier version preferred this one. And I did too! I’m not a big fan of spicy foods (even though I love boneless buffalo wings), a lot of times even store bought salsa is too spicy for me. 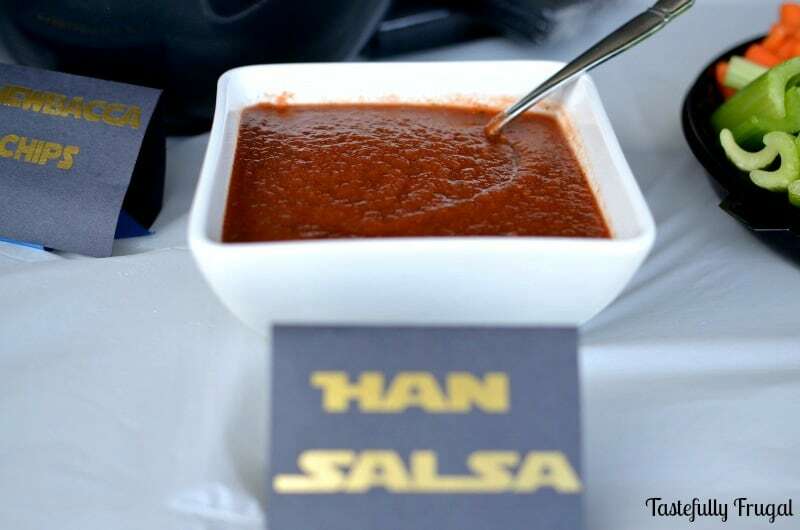 If you haven’t checked it out already you can read all about our Star Wars Party here. My 3 year old loves Star Wars and all he wanted for his birthday were Star Wars toys so I knew if I threw him any other kind of party he would be disappointed. We themed everything around his favorite characters (Han Salsa, Chewbacca Chips, Vader Veggies, Sparkling Leia Lemonade) and made light sabers out of pool noodles for the kids to battle with. 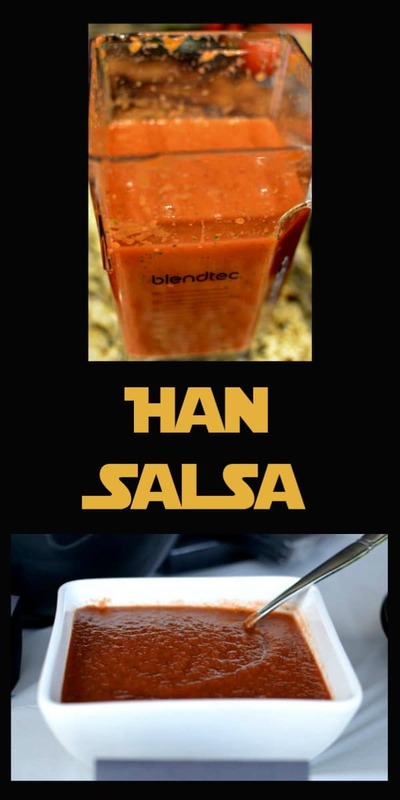 The light sabers were a big hit but the food fan favorite was definitely Han Salsa. Not only did I love the taste, I loved how easy it was to make too. All I had to do was throw everything into my Blendtec and blend for 30 seconds. I did it at the same time I was frying eggs. Can’t beat that! Place all ingredients in blender or food processor and blend for 30 seconds. 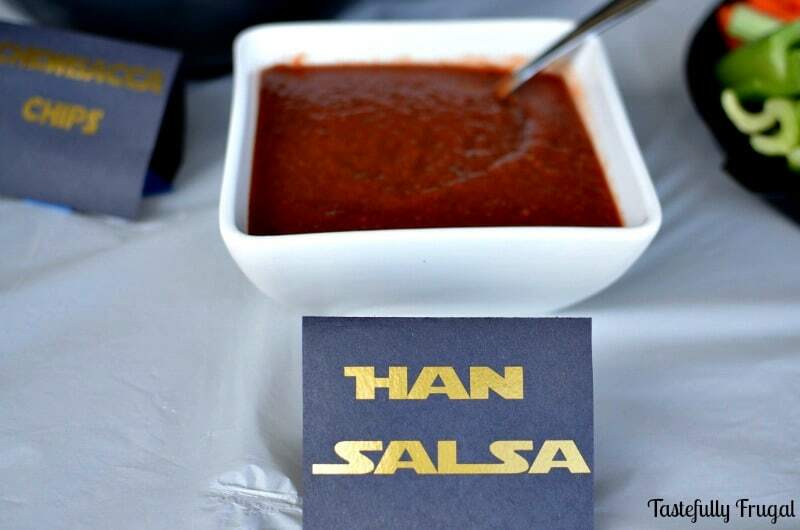 I love, love, love salsa… but it’s got to be homemade! This sounds and looks amazing, Sydney! You have such good recipes all the time!